From the outside, mosh pits are frightening places. From the inside, well, they’re not much better. They are, however, a formative experience for many a music fan, especially at festivals. Entering a mosh pit can be daunting. From not knowing if you’ll make it out in one piece to possibly losing a shoe or your wallet in the process, mosh pits are circles of uncertainty full of sweaty bodies enjoying the music so much that the only way to express that enjoyment is to jump around and bash into other people. Though mosh pits can appear at any concert, somehow forming as naturally and as unexplainably as sinkholes or drum circles, they are mostly associated with metal gigs. And though some genres may be more predisposed to mosh pits than others, there’s no age limit when it comes to rocking out. Filmed by Tina Granger at a Slayer concert in Idaho, the video shows Tina’s mother-in-law enjoying her first ever mosh pit, despite being a veteran metalhead herself. As the video shows, a group of enthusiastic music fans happily oblige and give the lady a taste of her first mosh pit. Clearly loving it all, the lady high fives people with one hand and, naturally, keeps her drink upright with the other. A bit of Dutch courage before entering a mosh pit is never a bad thing. Though it may look dangerous, moshing is actually, at its heart, a communal and friendly activity, designed to lift the spirits of all involved. There are, of course, a few common sense rules to stick to, however, to make sure it is enjoyed by all. The main one being, as per The Concordian, ‘If a fellow mosher falls, lift that person back up, check to make sure they are not hurt and continue to bump bodies’. Yes, you’re going to bump into people, but hurting others is not the aim. Other unspoken rules include: removing any spiked wristbands or other accessories that could cause injury, don’t throw punches (obvs), but also be aware of those around – you don’t want to get sucker-punched by a flailing arm or leg. Another favourite past time at gigs and concerts is crowdsurfing. Arguably less dangerous, but the chances of losing a shoe are just as high. 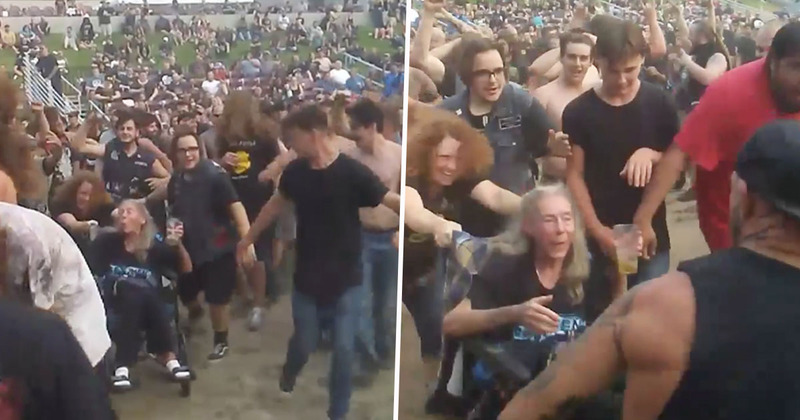 This incredible video, taken in Mansfield, Massachusetts, last month showed a woman getting wholly into the spirit of a metal gig as she was carried over the crowd in her wheelchair. Proving, again, there’s no limit when it comes to rocking out.